222: Can the drywallers get some of Goldman Sachs' welfare? "Two [employees] from Kenco came by yesterday down the alley. ... I yelled 'Hey Man, we're doing it for you,' " says Southwest Regional Council of Carpenters special representative Dean Crawford. 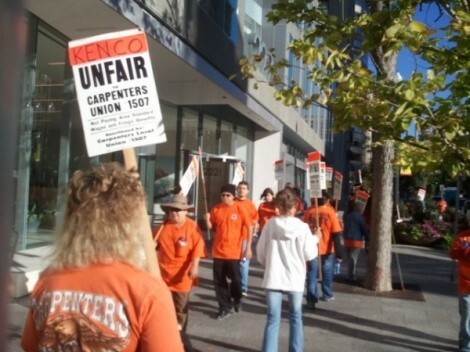 "[Kenco] employees want to see it happen, they want more money, they want insurance for their families." Crawford claims that Kenco charges employees such a high premium that many of them can not afford the health care plan.This picket is one in a series; Crawford says the union follows Kenco to any work site where they have been contracted. Layton-based Kenco's owner and president, Kendal Madsen, was not immediately available for comment. If he calls, this post will be updated. Crawford said Okland "used to be one of our guys" but about 2003, "they decided they didn't want to pay wages and benefits that are area standard." Okland representative Jeremy Blank was not immediately available for comment. If he calls, this post will be updated. Crawford said the best-case impact their picket could have would be for general contractor Okland Construction to agree to no longer work with Kenco Drywall, or for 222 Main Street's leasing agent, CB Richard Ellis, to no longer work with Okland. CBRE media relations spokesman Robert "Bob" McGrath, however, says that his company has not hired Okland, that one of the tenants must have done so. He didn't name who that could be. That's our federal tax money at work, meanwhile you have dry wallers who don't even have health insurance. The state of Utah approved a $27.3 million incentive package Thursday for financial services firm Goldman Sachs, bringing the total amount the company stands to collect to $47.3 million.... In 2001, the state granted Goldman Sachs a $400,000 incentive package in recognition of it opening an office here, and another $20 million in 2007 to expand in the Salt Lake area. It doesn't end there. I talked with Salt Lake City Mayor Ralph Becker's spokesperson Lisa Harrison-Smith in March about the city's own incentives to Goldman Sachs--which are only indirect. We offered a loan ... with the city to the tune of about $3 million through the [Redevelopment Agency] and the city, so they both came in at about $1.5 million, to Hamilton Partners, who are the people who built 222 Main. ... They have not yet applied for that loan, but that was the incentive made through the city. When was the last time you got a low-interest loan from Salt Lake City? (see my update below) Harrison-Smith could not confirm the interest rate on that loan, but said "it's a very low number, and it's something we offer to small businesses." So what you've got is one of the nicest buildings on Main Street--with a fab' glass-walled, fireplaced lobby fit for Don Draper--filled with people who work for or pay rent to a company receiving very significant amounts of corporate welfare. And still the drywallers don't have health insurance. Naturally, the argument in favor of all this welfare to one of the wealthiest companies in the universe and to the company that built its posh SLC digs is that restaurants, shops and all the business neighbors of 222 Main Street will benefit by having about 1,100 well-paid over-paid Goldman Sachs employees on the street. That's truthy enough, but should we the people who pay our taxes just accept the pennies Sachs employees toss at us for a pint of beer or a slice of pizza, even while we struggle to pay rent and get health care? Why aren't these millions and billions of tax dollars helping normal people first so that maybe we can become wealthy enough to actually need services from Goldman? I mean, really, dear reader, do you know a single person who has ever needed Goldman Sachs services? I don't know anyone that wealthy, but I live in the "other" America, not Goldman's America. Rather than pumping money into the already-wealthy class and just crossing our fingers that one of their royal employees might buy a cup of coffee from our locally-owned coffee shop--oh right, that's probably not going to happen either--we ought to bail out the middle and impoverished classes directly, and let our tax dollars trickle up to the Goldmans of the world. Update 12:48 p.m.: I should also note that Harrison-Smith said of the low-interest loan offered to Hamilton Partners, "you could compare it to the KUTV agreement during the Anderson administration." If that's true/fair/accurate, then it's my understanding that City Weekly also received some Salt Lake City assistance to move to Main Street.